If there’s one problem with kids, it’s that cars can easily see them and avoid hitting them, especially at night. Wait. That’s wrong. Kids are small and easily overlooked when crossing streets, and never more so than when cloaked completely in black on a dark Halloween night. 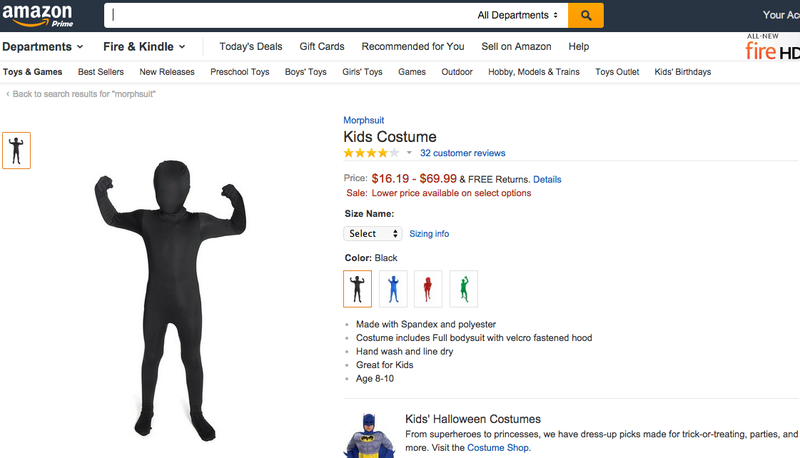 Consumerist reader Zack spotted this black bodysuit kids’ costume — which, to be fair, does come in other, brighter colors — and figured it might not be the best idea. During 1975-1996, from 4 p.m. through 10 p.m. on October 31, a total of 89 deaths occurred among pedestrians aged 5-14 years, compared with 8846 on all other evenings. Overall, among children aged 5-14 years, an average of four deaths occurred on Halloween during these hours each year, compared with an average of one death during these hours on every other day of the year. • Kids should stick to familiar areas that are well lit and trick-or-treat in groups. • Choose face paint when possible instead of masks, which can obstruct a child’s vision. • Decorate costumes with reflective tape and have kids carry glow sticks or flashlights. Excluded from that list? Cloaking your child in invisibility and covering up his face.